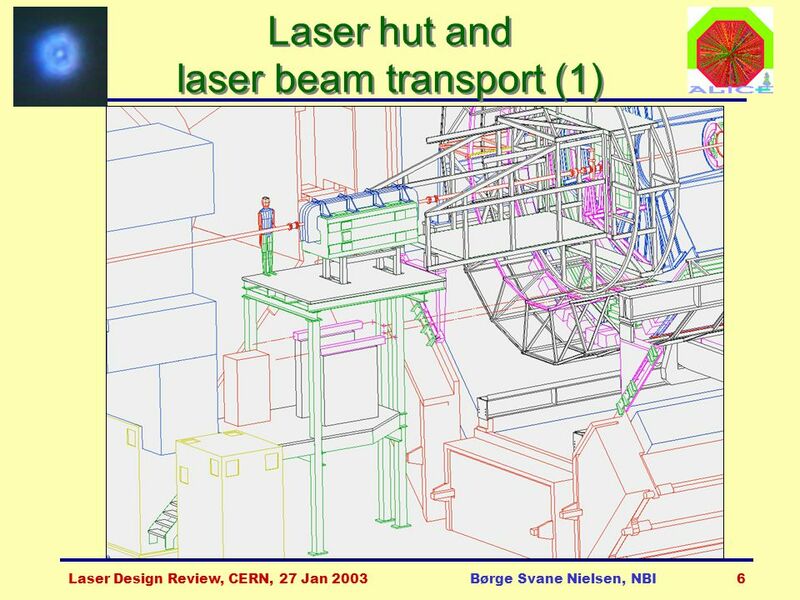 Laser Design Review, CERN, 27 Jan 2003Børge Svane Nielsen, NBI1 TPC Laser system  Functions of the system  Basics of the design  Construction tolerances. 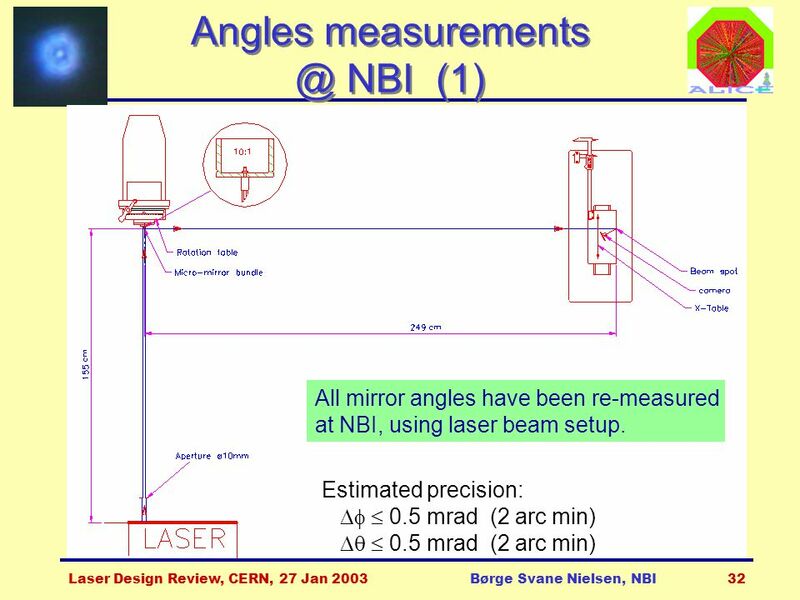 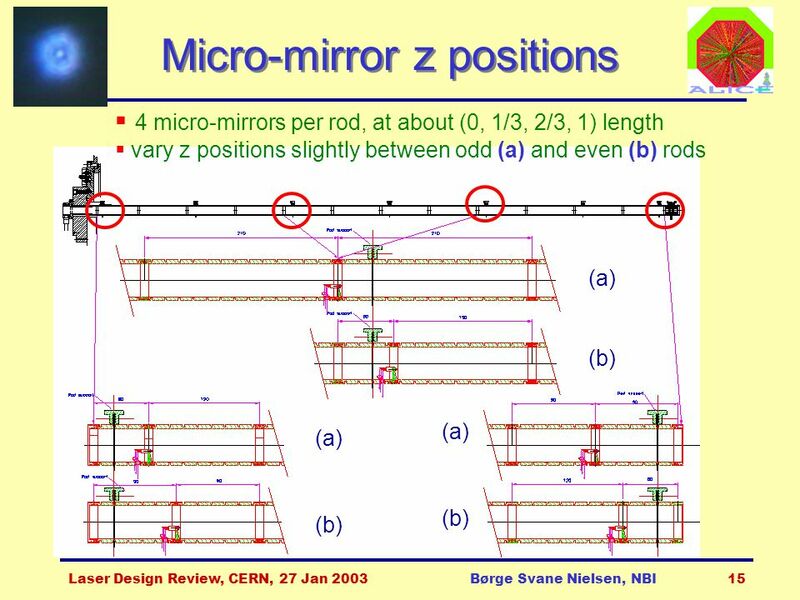 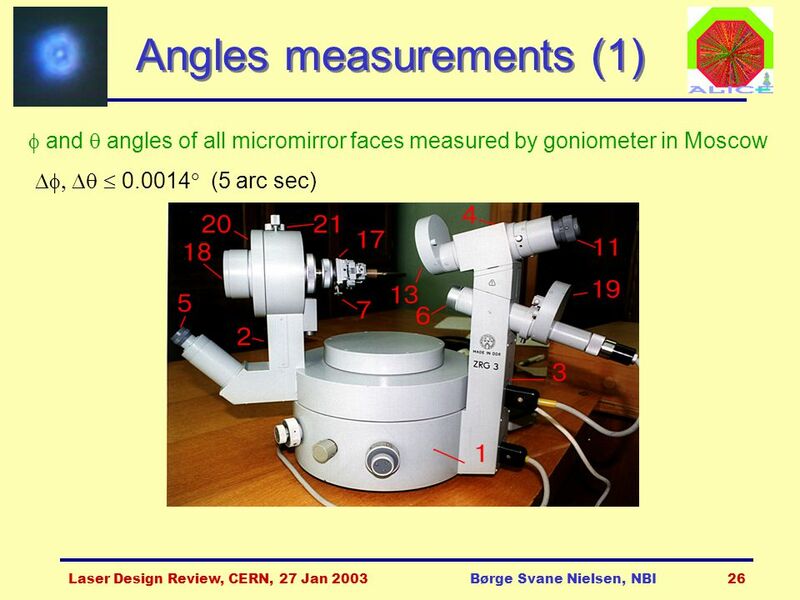 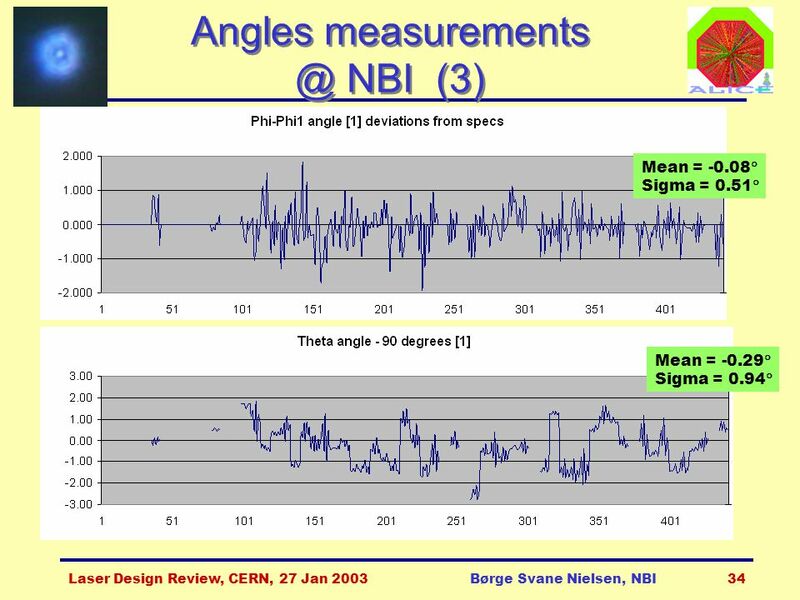 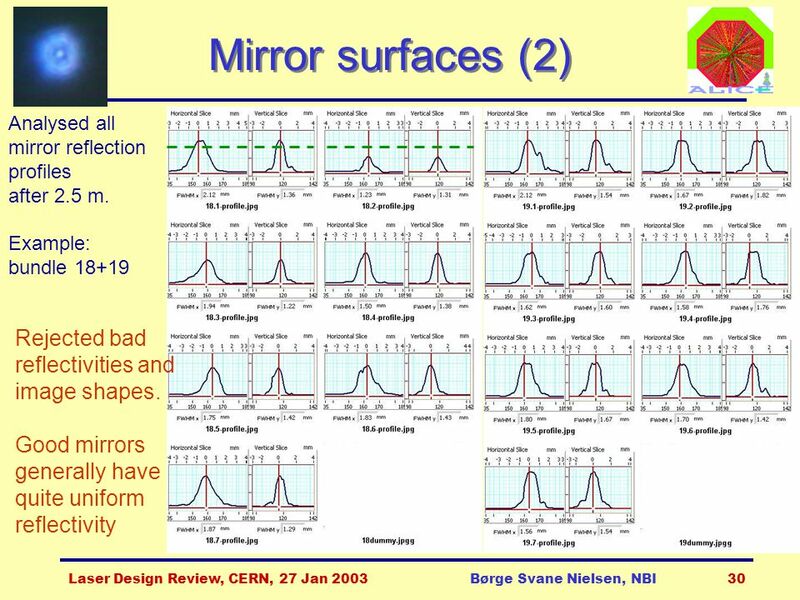 18 Laser Design Review, CERN, 27 Jan 2003Børge Svane Nielsen, NBI18 Stability of laser and beams Design with micro-mirrors  laser ray positions determined by the mirror positions and angles, not by the main laser beam or movable optics. 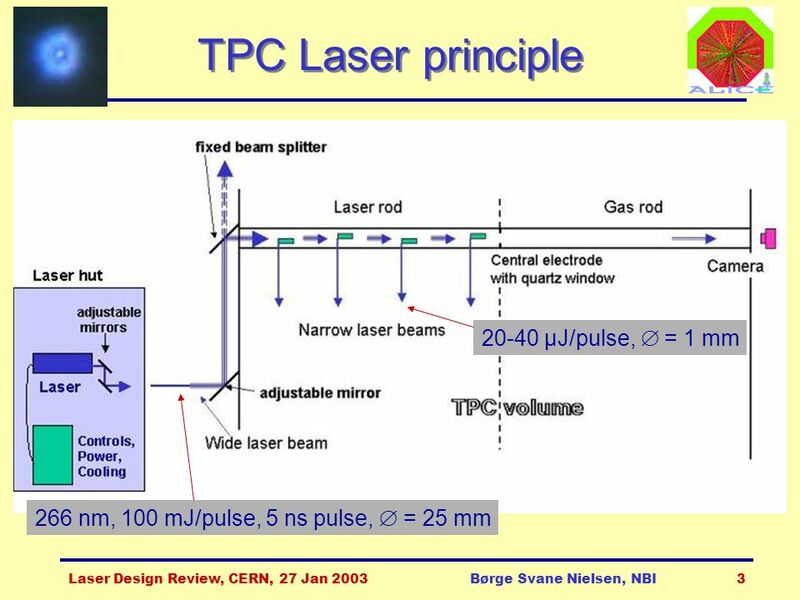 Mechanical stability of the TPC is good enough for precise (100  m) relative measurements once the TPC is installed. 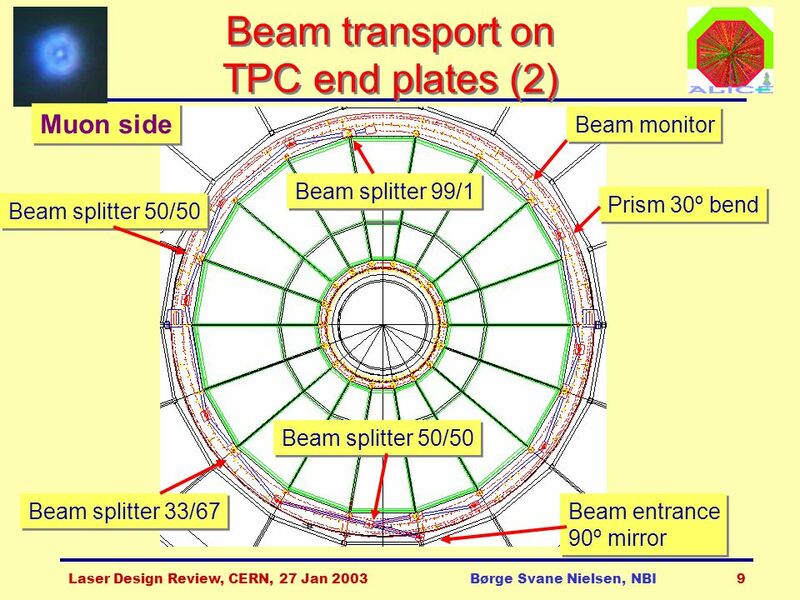 During construction and installation, the TPC will undergo stresses due to handling (rotation) and change of loads (ROCs, cables etc). 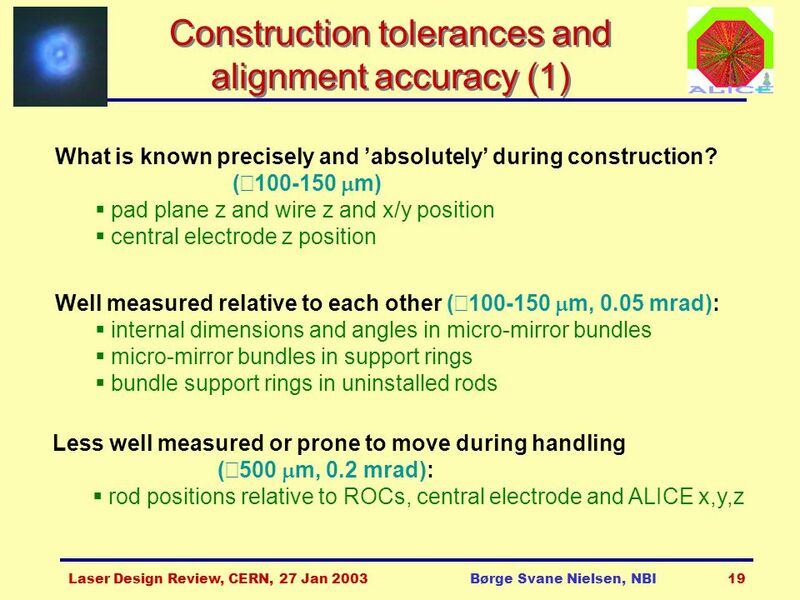 ’Absolute’ positions must refer to: TPC end plates, ROCs and Central Electrode. 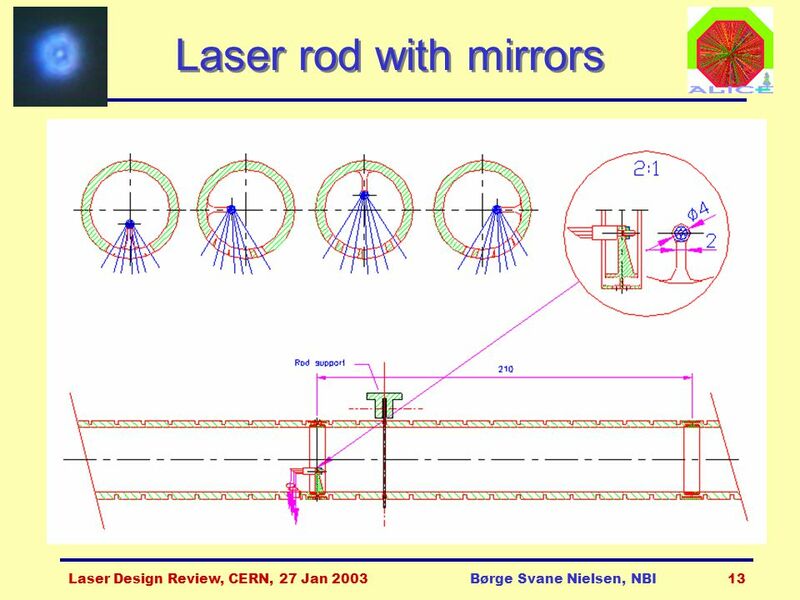 36 Laser Design Review, CERN, 27 Jan 2003Børge Svane Nielsen, NBI36 Rod gluing 1.Drill holes in short rods 2.Mount mirror bundles in support rings. 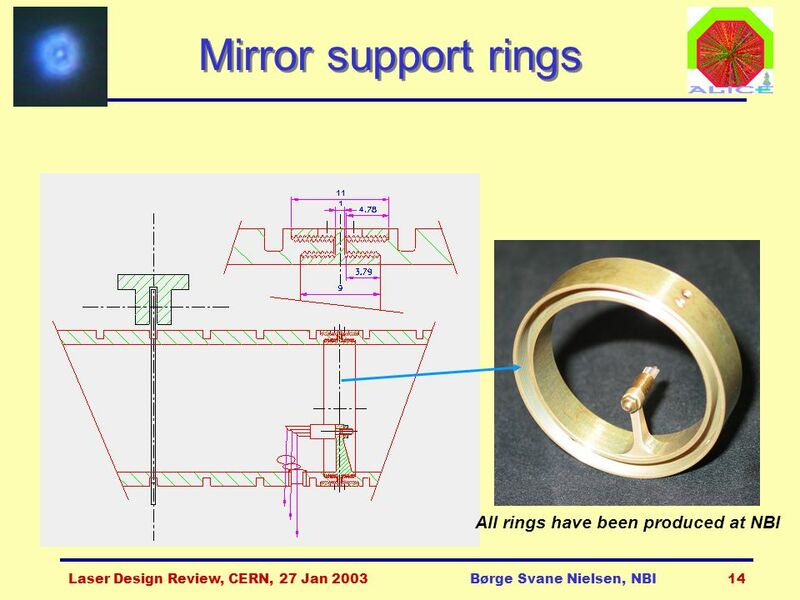 3.Glue mirror support rings onto short rods. 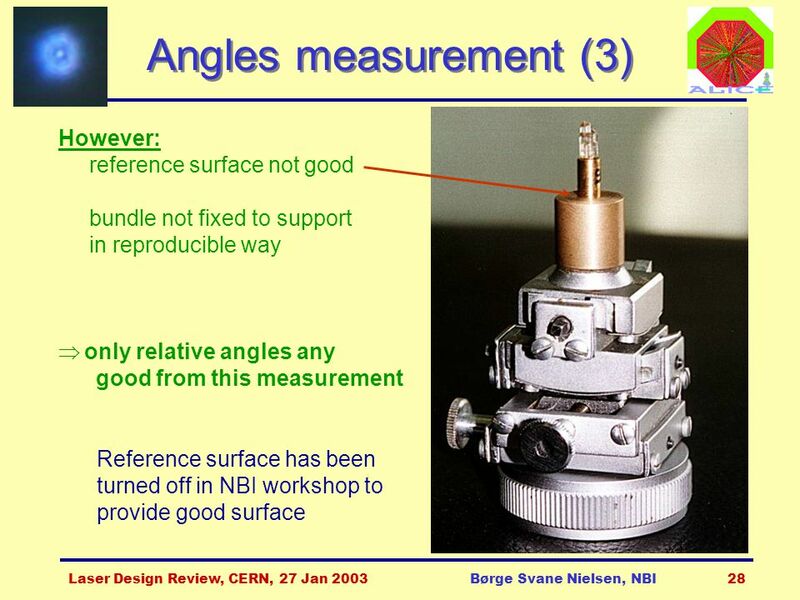 Theta alignment guaranteed by jig + machined surface 4. 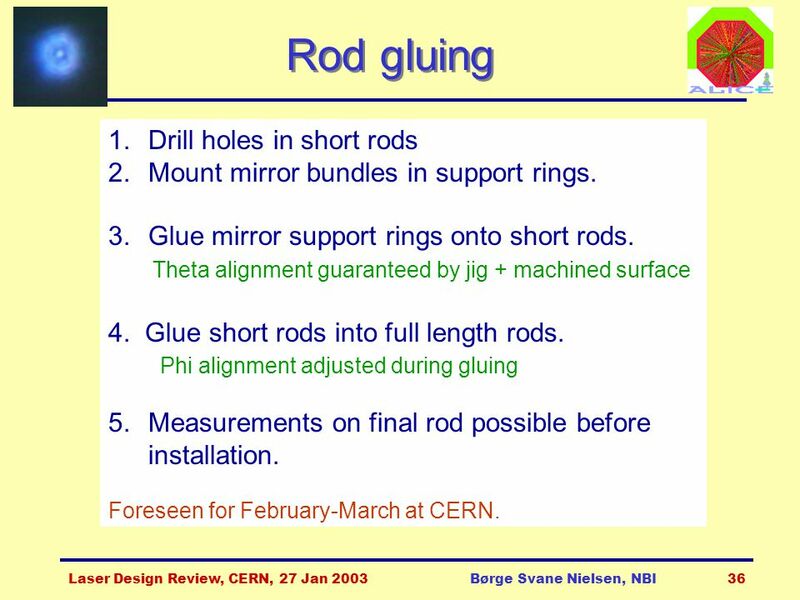 Glue short rods into full length rods. 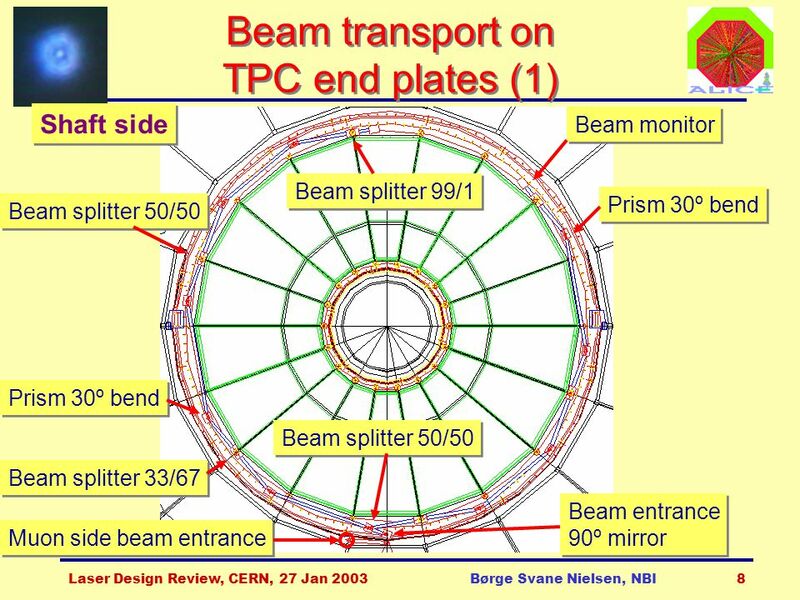 Phi alignment adjusted during gluing 5.Measurements on final rod possible before installation. 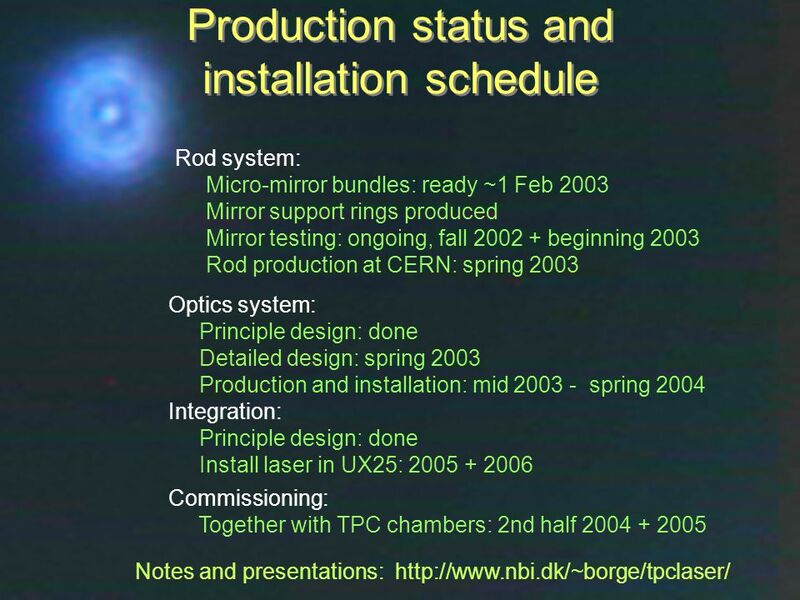 Foreseen for February-March at CERN. 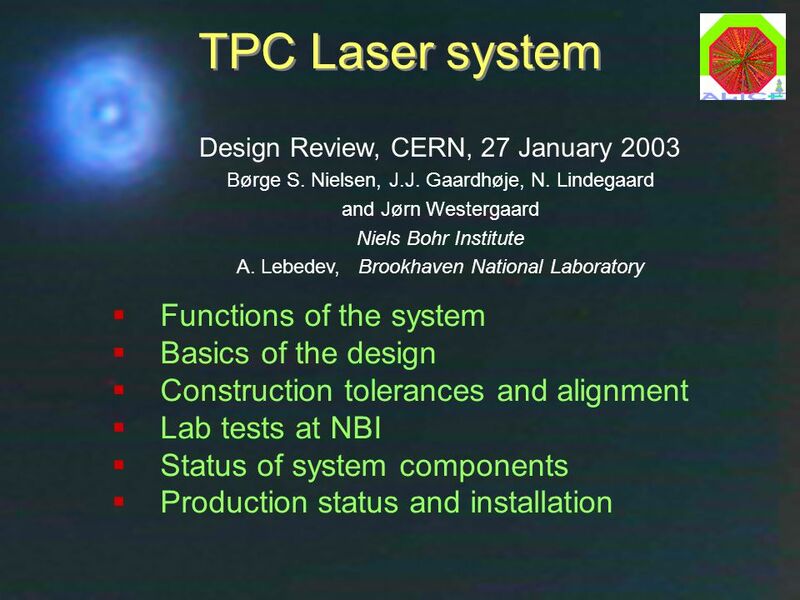 Download ppt "Laser Design Review, CERN, 27 Jan 2003Børge Svane Nielsen, NBI1 TPC Laser system  Functions of the system  Basics of the design  Construction tolerances." 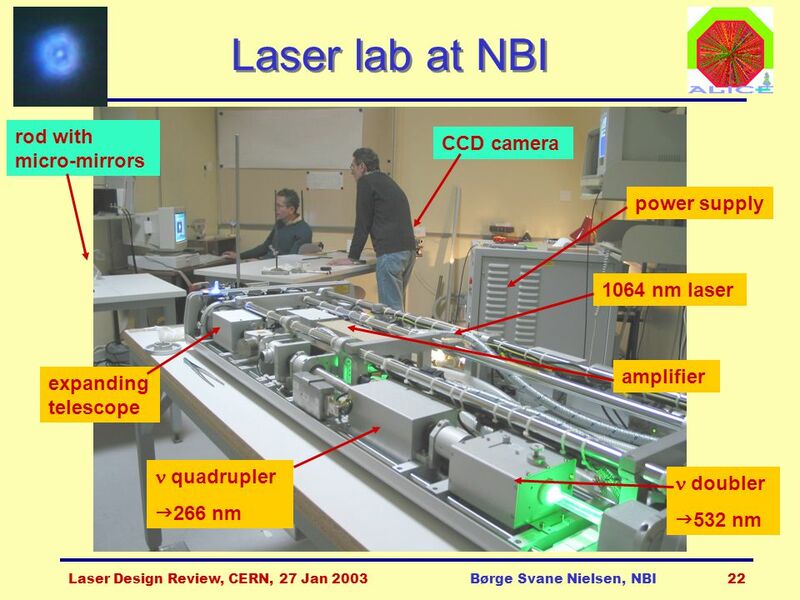 TPC meeting, Sardinia, May 2004Børge Svane Nielsen, NBI1 Status of laser system TPC meeting, Sardinia, May 2004 Børge Svane Nielsen Niels Bohr. 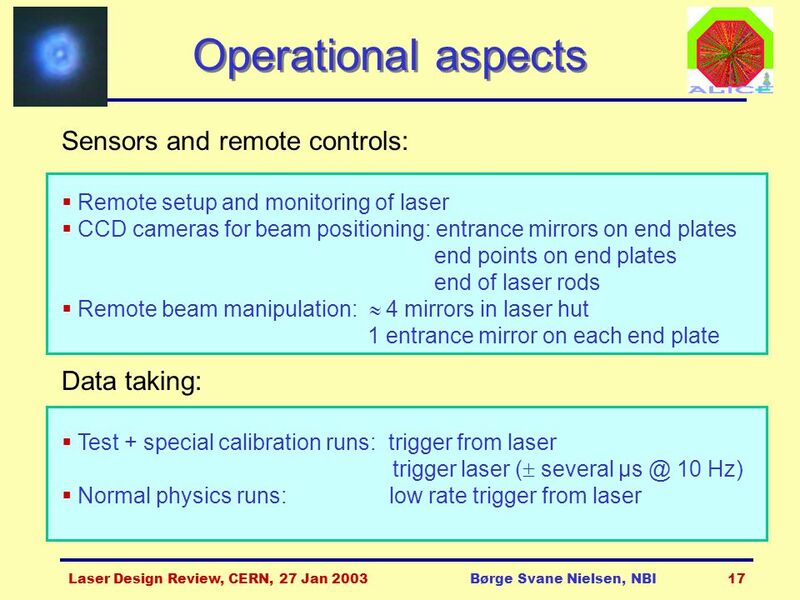 TPC meeting, CERN, January 2003Børge Svane Nielsen, NBI1 Status of laser system TPC meeting, CERN, January 2003 Børge Svane Nielsen Niels Bohr. 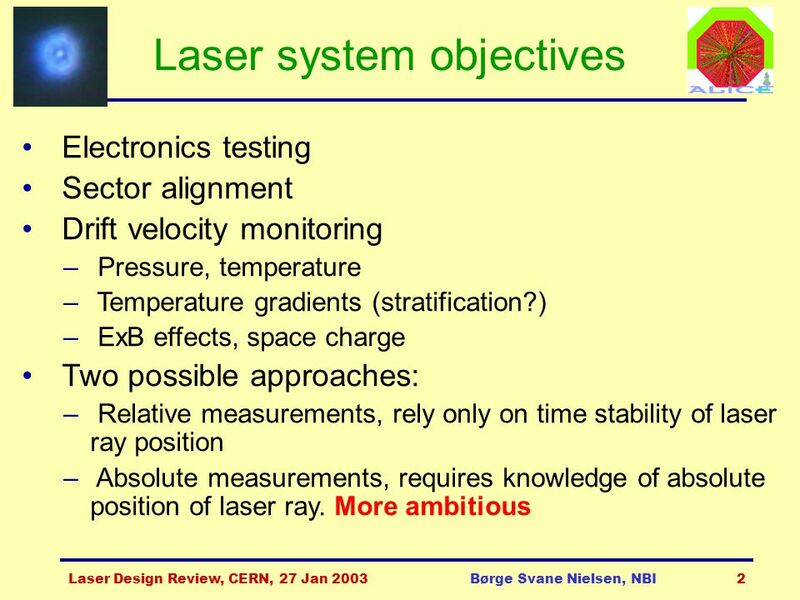 Technical Board, CERN, 14 May 2002Børge Svane Nielsen, NBI1 TPC Laser system  Functions of the system  Basics of the design  Design updates since February. 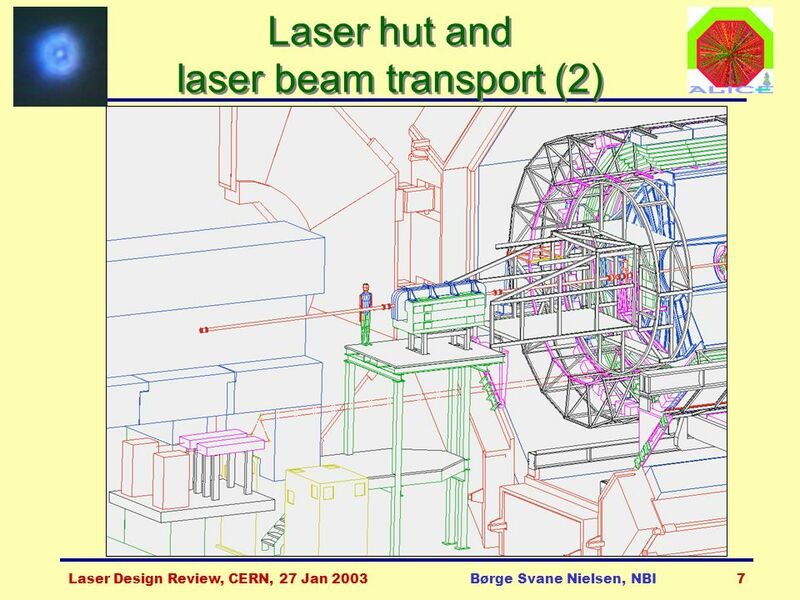 TPC meeting, CERN, April 2002Børge Svane Nielsen, NBI1 Status of laser system TPC meeting, CERN, April 2002 B.S.Nielsen, J. Westergaard Niels. 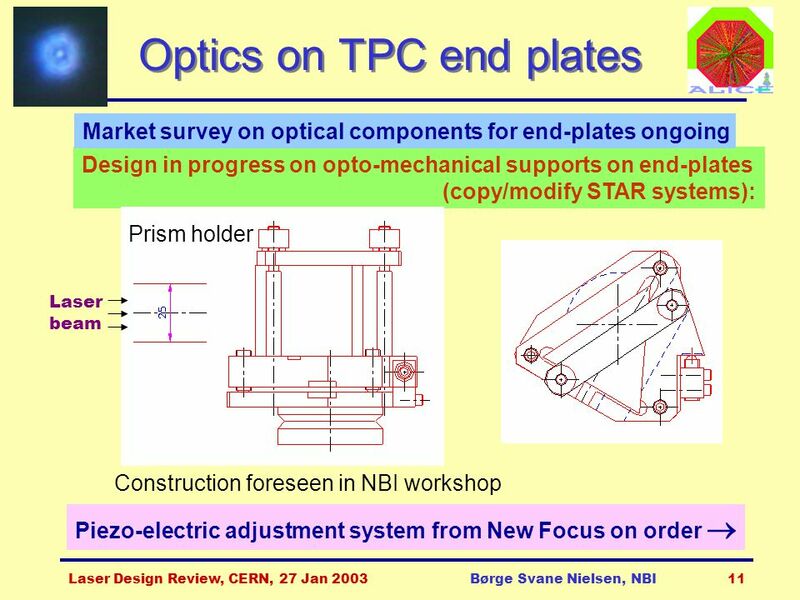 TPC meeting, GSI, 2-3 June 2003Børge Svane Nielsen, NBI1 Status of laser system TPC meeting, GSI, 2-3 June 2003 Børge Svane Nielsen, Jørn Westergaard Niels. 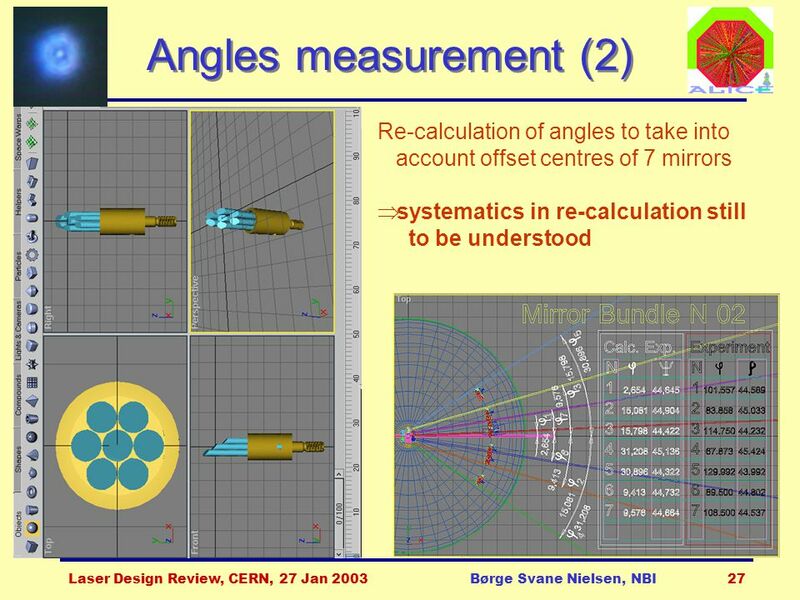 EMMA Magnet Design Ben Shepherd Magnetics and Radiation Sources Group ASTeC STFC Daresbury Laboratory. 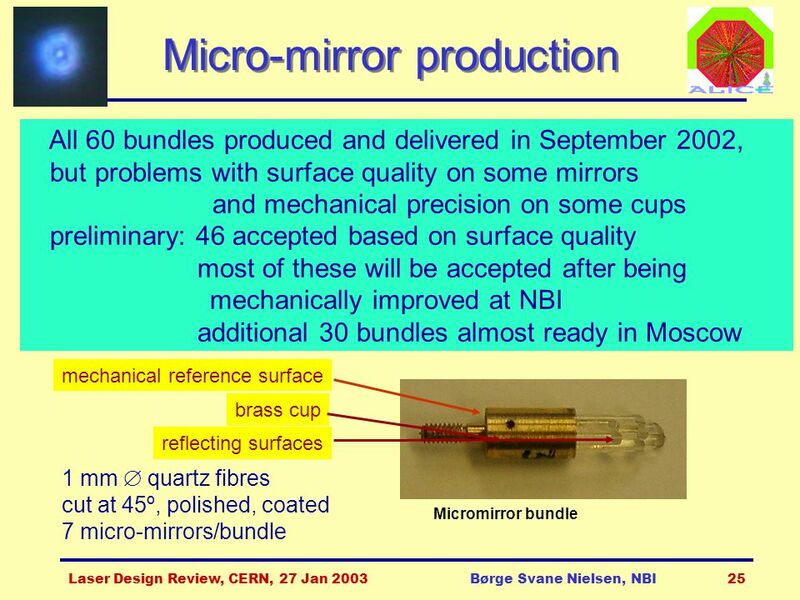 DCS meeting, CERN, 17 June 2002Børge Svane Nielsen, NBI1 Forward Detectors DCS Forward Detectors (FWD): T0- quartz Cherenkov V0 - plastic scintillator. 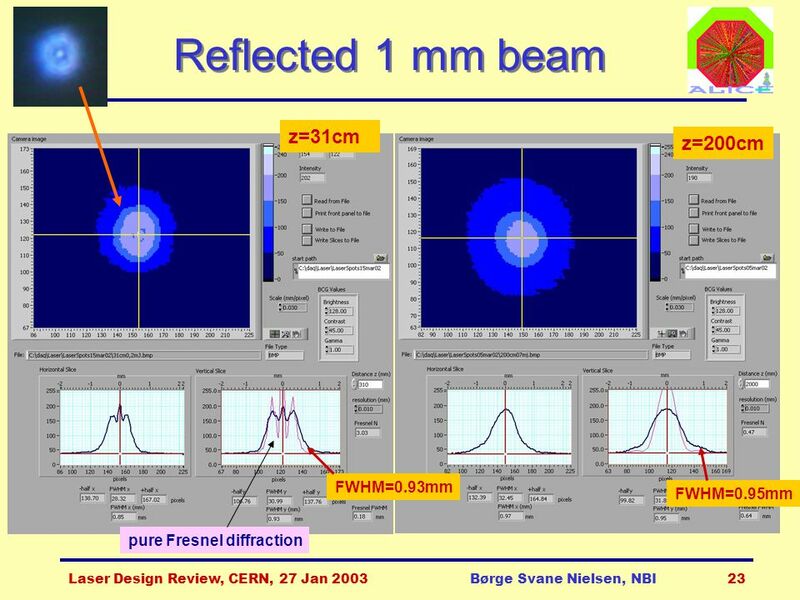 Technical Forum, 8 March 2007Børge Svane Nielsen, NBI1 Status of the FMD Børge Svane Nielsen Niels Bohr Institute FMD 1 FMD 3 FMD 2 Outer ring Inner ring. 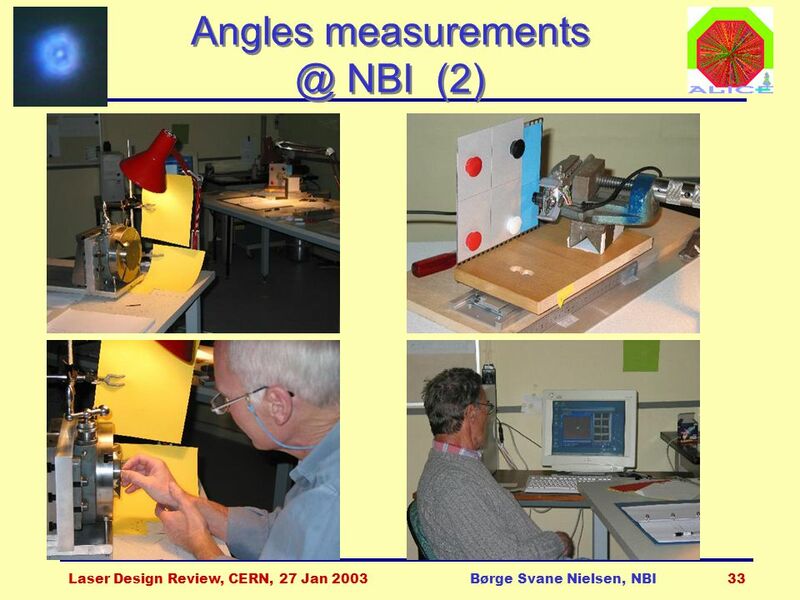 Technical Board, 12 July 2005Børge Svane Nielsen, NBI1 Status of the FMD Børge Svane Nielsen Niels Bohr Institute. 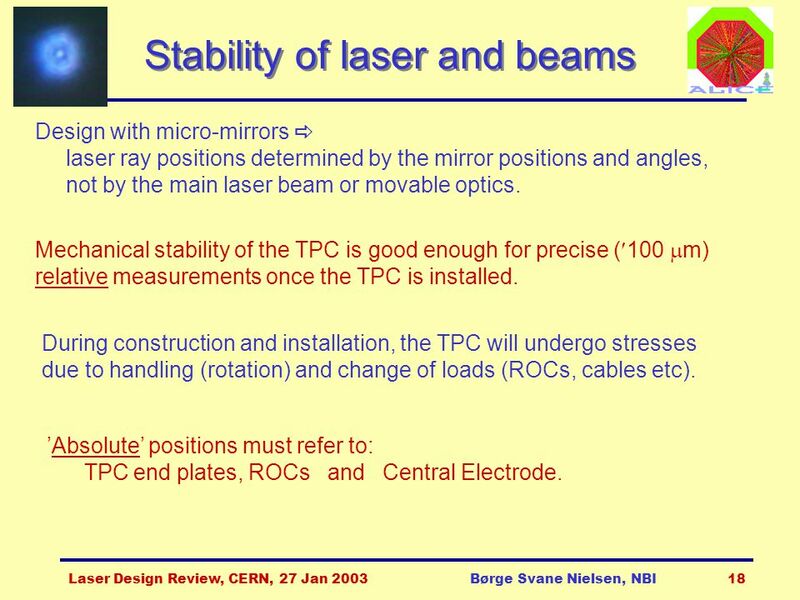 TPC meeting, NBI, 2-3 September 2002Børge Svane Nielsen, NBI1 Status of laser system TPC meeting, Copenhagen, 2-3 September 2002 Børge Svane Nielsen, Jørn. 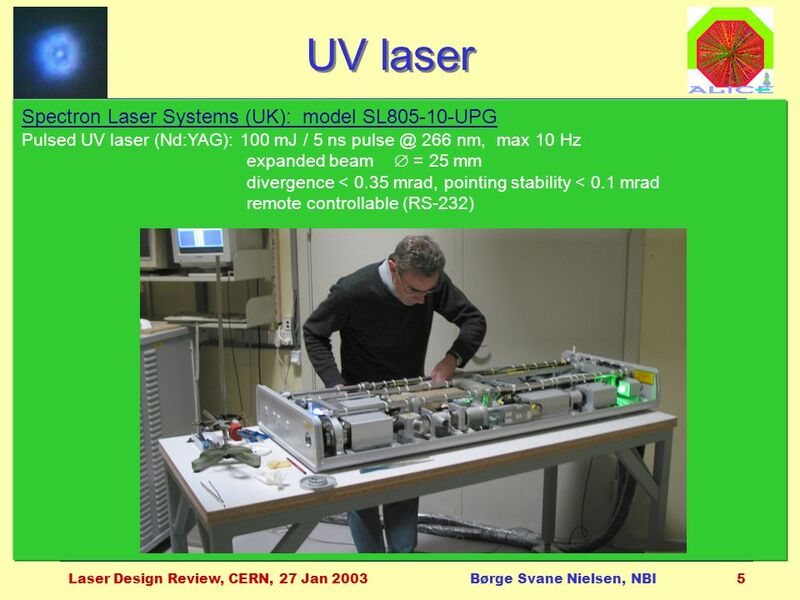 Technical Board, 18 September 2002Børge Svane Nielsen, NBI1 Laser rays on TPC mylar strips Technical Board, 18 September 2002 Børge Svane Nielsen and Jørn. 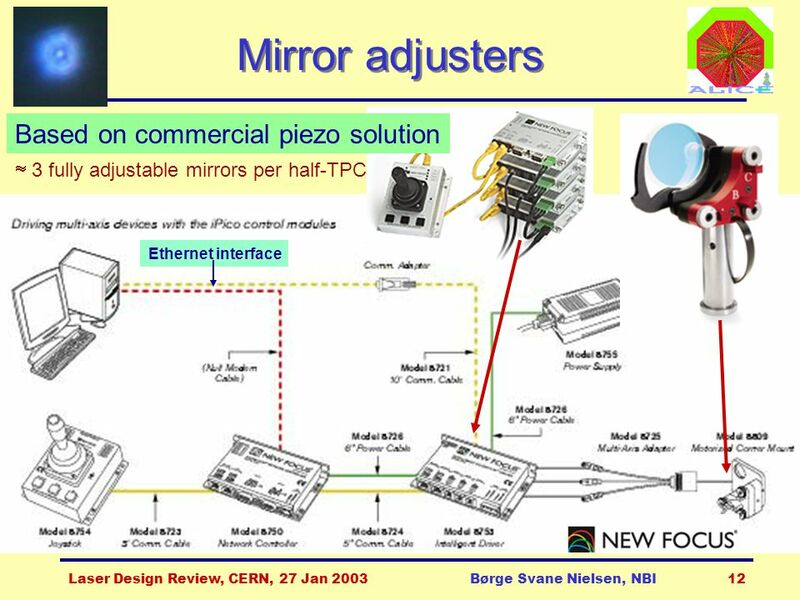 ALICE TPC field cage status Sardinia May 2004 Michael Hoch Cern-TA2. 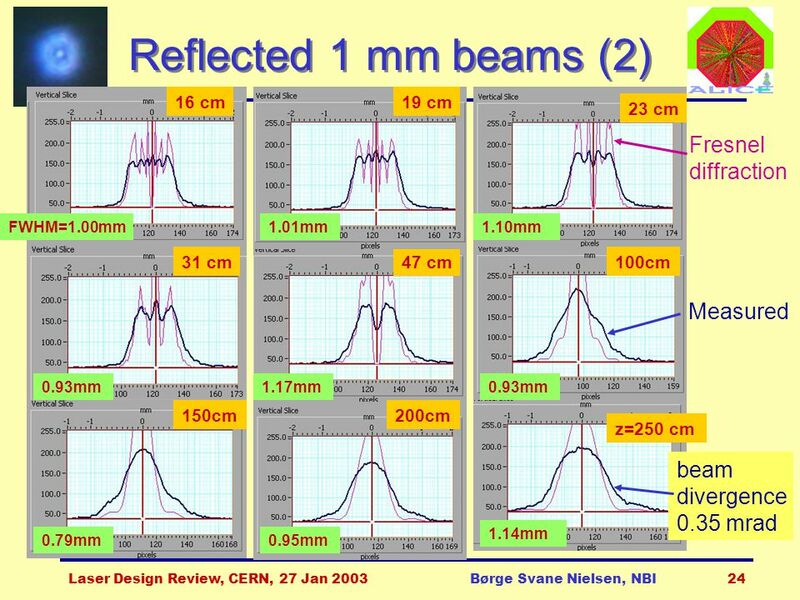 ATF2 Interaction Point Beam Size Monitor (Shintake Monitor) Status T. Yamanaka, M. Oroku, Y. Yamaguchi, S. Komamiya （ Univ. 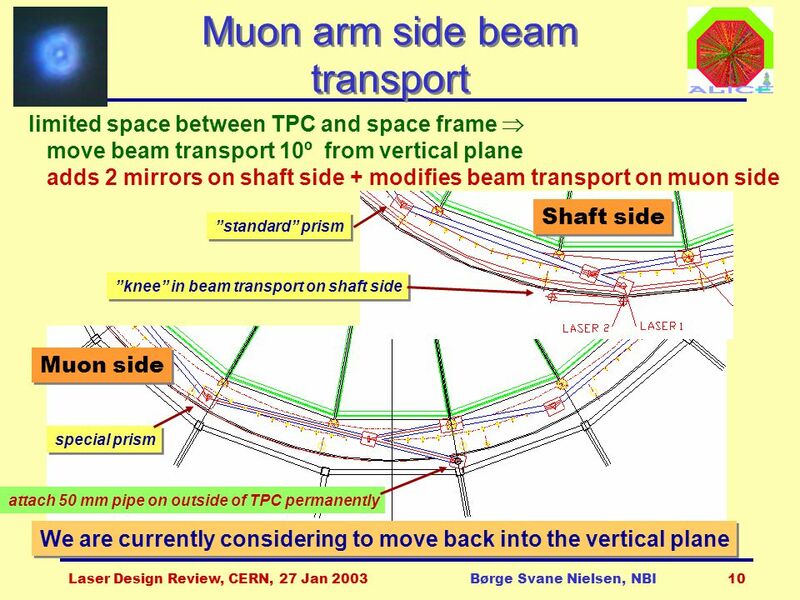 of Tokyo ）, T. Suehara, Y.
TPC status Marian Ivanov. 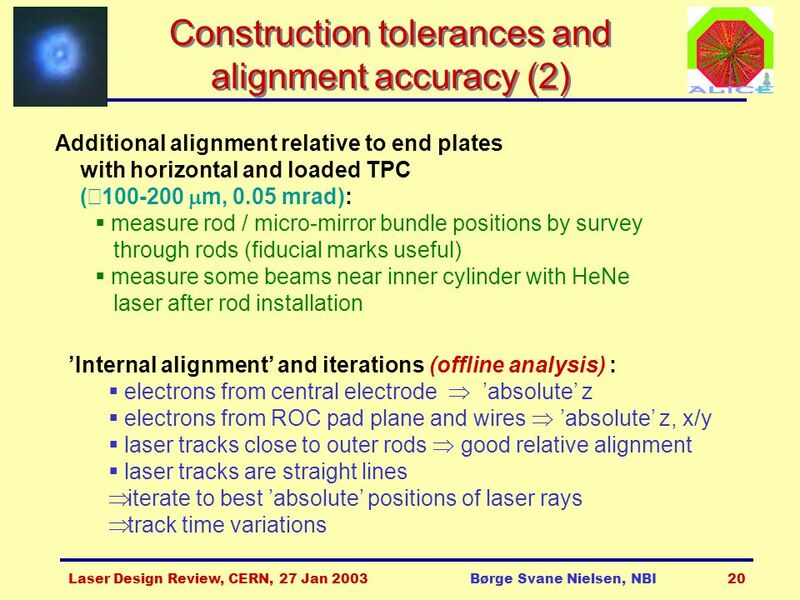 Outlook TPC performance ExB correction Alignment Nonlinearities and edge effects Drift velocity calibration. 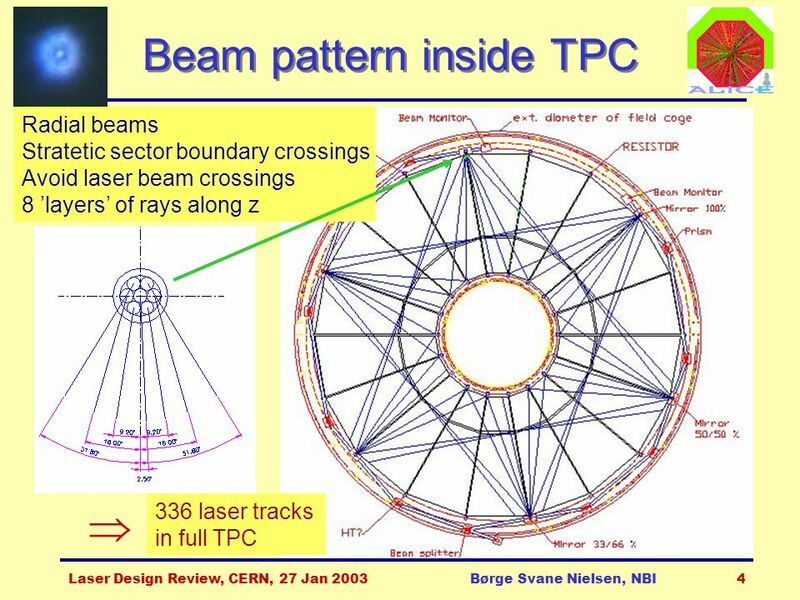 TPC Calibration with laser tracks B.S. 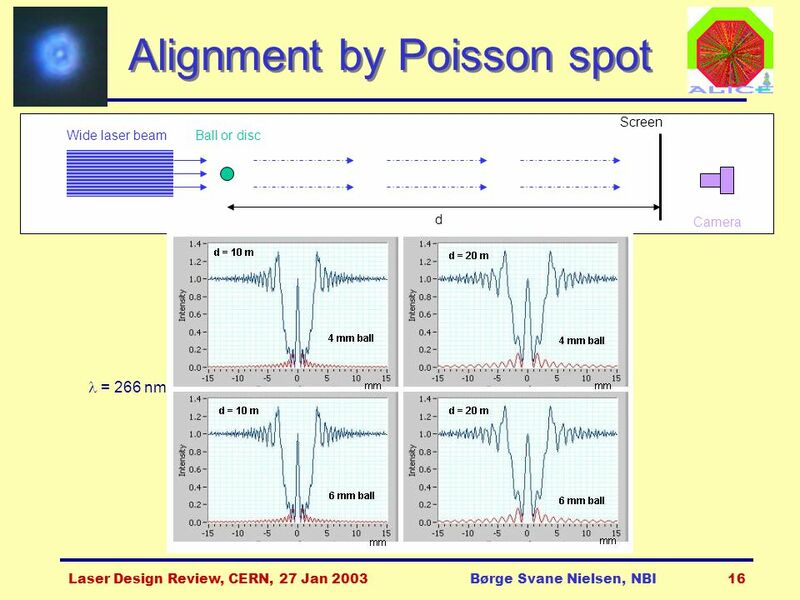 Nielsen & G. Renault for the ALICE Collaboration Niels Bohr Institute. 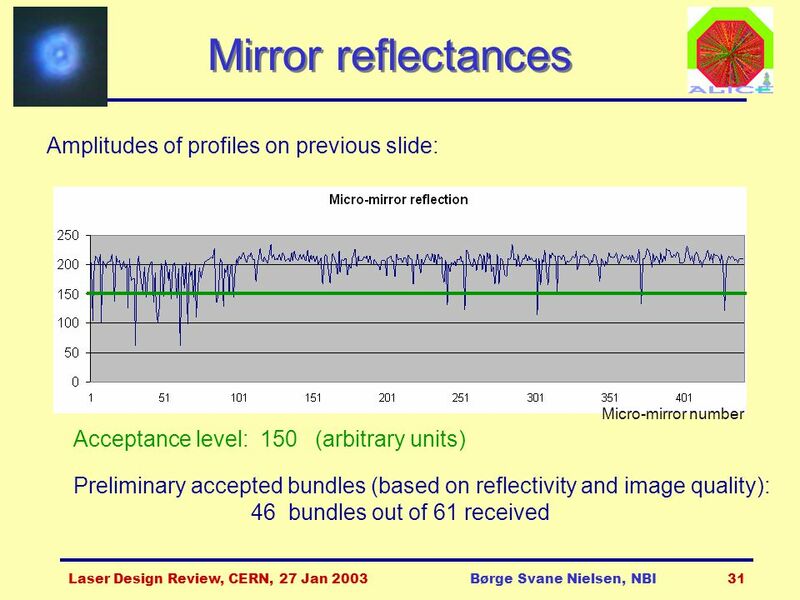 Study of GEM-TPC Performance in Magnetic Fields Dean Karlen, Paul Poffenberger, Gabe Rosenbaum University of Victoria and TRIUMF, Canada 2005 ALCPG Workshop. 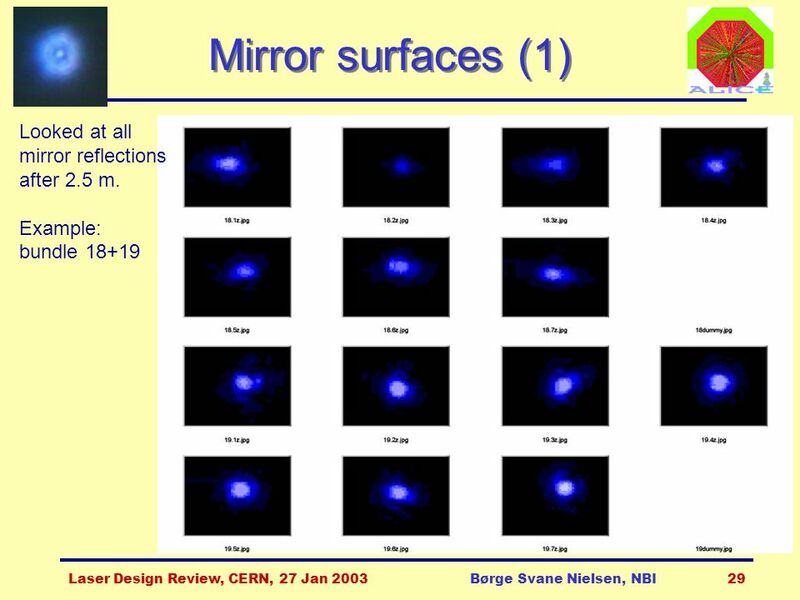 INFN of Genova, Pavia and Roma Flavio Gatti, PSI, February 9 th, Timing Counter status Timing Counter status. 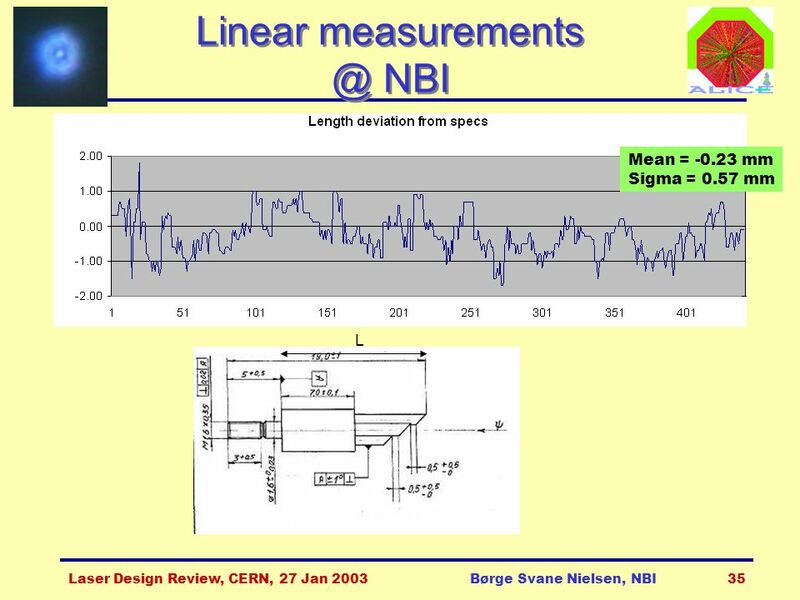 LHCC referees meeting, 10 October 2005Børge Svane Nielsen, NBI1 Status of the FMD LHCC referees meeting, 10 October 2005 Børge Svane Nielsen Niels Bohr. 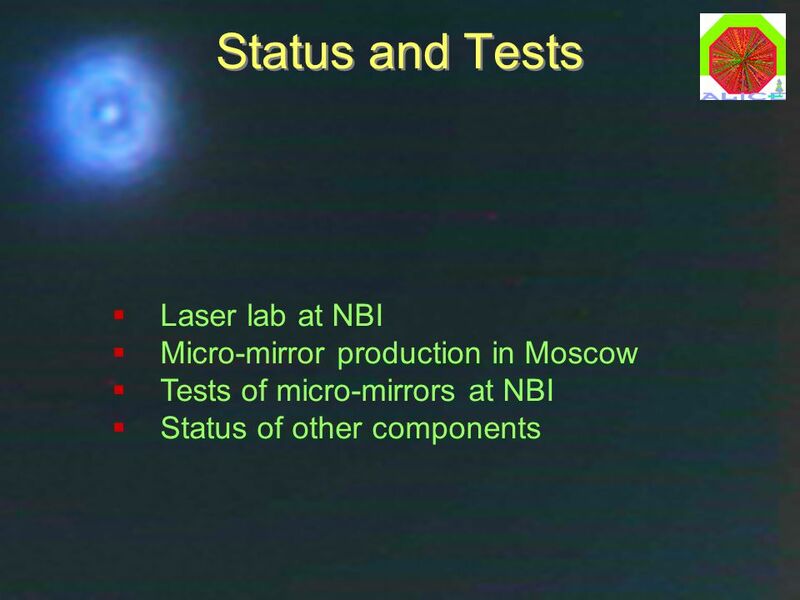 LumiCal High density compact calorimeter at the ILC Wojciech Wierba Institute of Nuclear Physics PAS Cracow, Poland.